The AU$ created a “W” (Double Bottom) back in 2001 as a 13-year bear market was coming to an end as a new 10-year bull market was getting started. As the AU$ was moving moving much higher from 2001 to 2011, Gold, Silver, and Commodities went along for the ride. 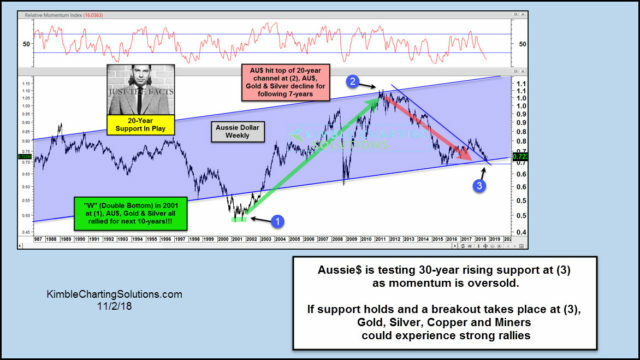 Joe Friday Just The Facts Ma’am- The AU$ is testing 30-year support at (3), with momentum oversold. If 30-year support holds and it breaks above falling resistance, it would send a bullish message to Gold, Silver, and Commodities not see in years!